It is satisfying to see the garden plants stretch out and grow. About the yard this time of year, things change everyday. The Iris were beautiful and now gone, but poppies and beauty bushes have new blossoms every morning.I like to take note in the morning of each new flower, bud, and the condition of all in the yard. I am struck by the thought that nothing will ever be the same as it is today and if we don’t stop to look at what is there, it will be forever gone. I turn from the outdoors and get set to mix my dyes. I usually mix a selection of colors that complement a group of batik with a similar theme and color scheme. Mixing dyes is not my favorite task, but dyeing batik is. I’m working with Procion fiber reactive dyes. These are the best for dyeing batik, as the color actually binds to the fabric and they work as cold water dye. 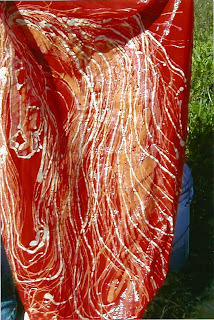 This is important as batik need to have a cool temperature (95 degrees to 110) to maintain the wax on the batik. Hotter temperatures will soften and even melt the wax on the batik, destroying the design. The temperature can be cooler, but the dyeing process will take longer. Very cold temperatures will cause excess crackling of the wax, but beeswax is less likely to crack. Most often I use a mix of parafin and beeswax. These dyes are in powder form, and it is best to wear a dust mask when mixing several batches. Colors are handled differently. Darker, more intense colors, require more volume of dye (2x to 3x as much) and also salt, than lighter colors. I use a measuring cup and small amount of warm water to “paste” the dye. Next, very hot water is added to blend the dyes, stirring constantly, untill all is dissolved. Salt and fabric softener are also dissolved and added to a pail of lukewarm water.The dissolved dye is strained through a thin old cloth to catch any flecks of dye. More hot water is repoured through the dye on the cloth so none is wasted. Red is an especially difficult color to mix. Calsolene oil is helpful in dispersing the color bursts. The dyebaths are put in large plastic pails and a few are in longer shallow trays ( good for larger pieces where crackling is not desired.) Colors in the dyebaths can last about a week, especially with some urea added. Once the soda ash (washing soda) is added, the dyes have a life of several hours only.The soda ash is needed to activate the dye and if I’ve mixed enough dye to do pieces for several days, there is an alternative method to use. The fabric can be soaked in a seperate soda ash bath and drained prior to adding to the dyebath. this gives the dyes more time to be used, however, each piece of cloth added removes some dye particles until the colors get paler and finally become exhausted. 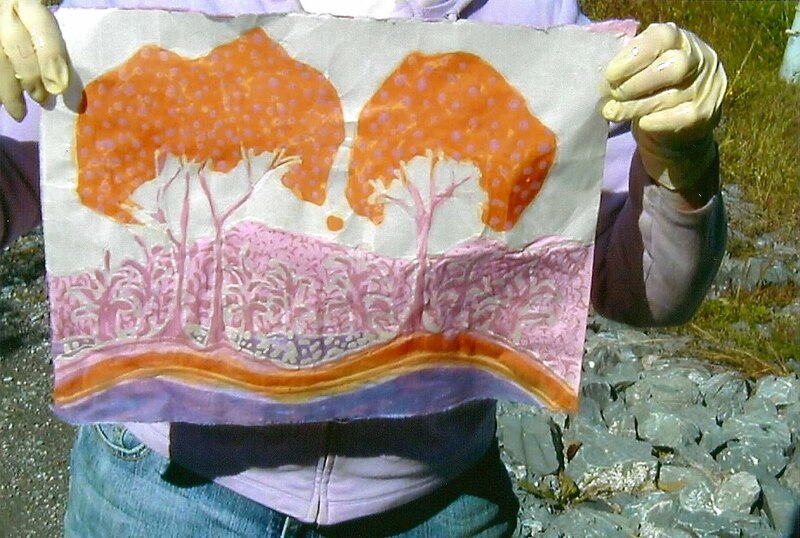 I’ve included some pictures of a small tree batik before and after dyeing. 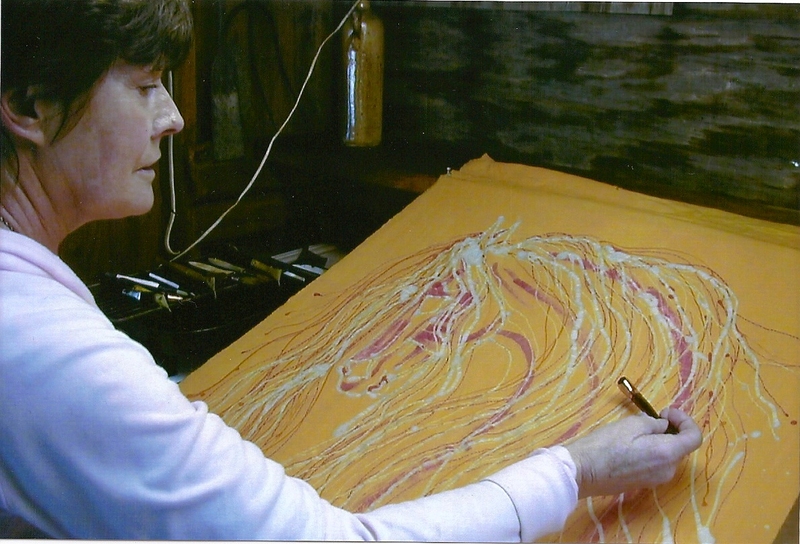 Also shown is my large horse batik being waxed with a tjanting, and then held up after being dyed in red. Just a few more colors need mixing and I’ll……….Oh no!My yearling heifer, Footstep has slipped through the fence. The old fence controller has failed. I walk over to my calm peaceful heifer and she’s decided it’s nice to be out. As I approach to put on a halter, she gives her head a toss, turns with a leap and runs off across the newly mowed field of alfalfa north of our house. Nothing will be dyed today.